I apologize up front if you thought this blog was something about successful parenting or behavioral science. The boundaries I'm talking about are those on which you put a fence. The only behavioral modification I'm after is when my donkey, llama, or goat stop at the boundary and I don't have to chase it. The bad drawing up above is the property that had bad boundaries before I got started. The reason I had to do that after 16 years is part of what the story is about. Doing it is another part. Sometimes things just don’t turn out perfectly. Letting me play with straight lines is sort of like letting a toddler play with matches. This picture depicts three plots of land that are 212’ wide and 935’ long. The quasi vertical thing that looks like a river ambling through it is a natural gas pipeline right of way. It decided to take a turn about the time it hit our property. The center plot happens to be the piece that God allowed us to stumble across about 16 years ago. A few years back I complicated things by deciding that we just had to have critters. We had plenty of grass and weeds to make them happy so a short time later we had three sheep and a donkey. Having those critters meant that I needed to start using some of that vegetation I had been ignoring. Before we had it the property was owned by Weyerhauser Lumber and it didn’t appear to have been cut for several years. I asked my neighbors for help locating the property line between the top property and ours. I was told to just put up the fence and it would be all right. Nobody was planning on going anywhere and nobody cared. I accepted this with some misgivings. I wasn’t sure that nobody was going anywhere. In the deep woods at the back I tried to ensure that the fence was on my property and not my neighbors. The line was nowhere approaching straight and I knew it, Placement was in order to avoid the demands of any unreasonable future purchaser. On the other side (between us and the bottom property) there was a survey road and I could see that it was far from straight. My neighbor used it from time to time and so did I. I told him my fence would follow the road and not the property line and we left it at that. The neighbors at the top had grass that just grew and grew. I offered to fence off about three acres and let this landscape crew do the lawn maintenance. They took me up on that and for a year the vegetation was pretty well eaten down and all concerned were happy. During that year, however, the neighbors on the bottom decided it was in their best interest to take a job in Austin. They sold the property to the neighbors on their other side. When I told the new owners that the property line was off they told me not to worry about it. They were not planning on selling and the survey markers were missing. Deja vu all over again. The road on the drawing is the road running vertically on the left hand side of the picture. You can see two driveways at the top of the picture and my drive is a hundred feet or so further down. I have trees that arch over my drive so you cannot see it from the air. Running diagonally through the center of the picture is the right of way for the natural gas pipeline. No trees are allowed there. If you don’t cut them the pipeline company will. 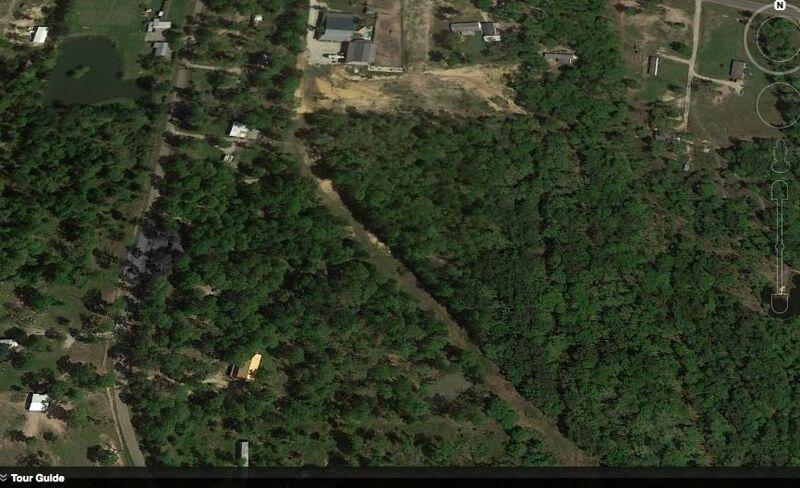 The big scar at the top center of the picture is the boundary of the property I had fenced off. That scar is owned by someone with ambition to own more and this is obviously being put to the highest and best use. That neighbor agreed to buy the three acres I had fenced off. The next thing I knew a survey had been made complete with survey stakes that identified the property line. That was enough to give me my next project and turn my schedule upside down. If you look at the dashed lines on the homemade drawing they represent where the fences had been installed. I stand to gain as much as 30-40 feet in places and loose less than six inches in others. This is Cruz and Elvis. They had decided to help me but Cruz became sidetracked when he discovered the properties of my side mirror. You can see the barbed wire and you can see the fence post where the old fence is still hanging. This is about the most I was off in those instances where I am losing property You can see the barbed wire just beside the donkeys and the pole is about two feet away. In the rear I have already extended the fence out to the survey stakes but have yet to open up the area to my critters. Surveys are great when someone else pays for them and it works out to your benefit. I also used the opportunity to take these survey marks and make measurements for the other side. This is hay bale twine from the square bales I have used over the years. They seem to come out of the ground after a good rain so I expect there are still more to come. I wrapped them around two screws that were 10’ apart. Thats a lot cheaper than buying a super long tape or hiring a surveyor. I measured off 212’ to use for measurement of the property width. Then I started another string that became over 1000’ long. When I get that boundary marked off my neighbor and I will confer on it and I will string another fence. A top notch line like this deserves a top notch holder. This was made from a type of plywood that I call scrap. This oaken pole that looks like it’s been sharpened is what happens to poles after a few years. This pole was part of a tree till hurricane Rita came through about six years ago. Most of that sharpening happened in just a couple years. These landscape timbers were installed about the same time. Not a lot to brag about since the EPA outlawed the original poison that made them so effective. More than likely I should thank them because our drinking water is safer. This type fence post is probably the answer. You can get them at the hardware store or Tractor Supply. They are called T posts and this one probably cost less than four dollars. You can run barbed wire and hang range fence on the barbed wire. It's cheap and durable. 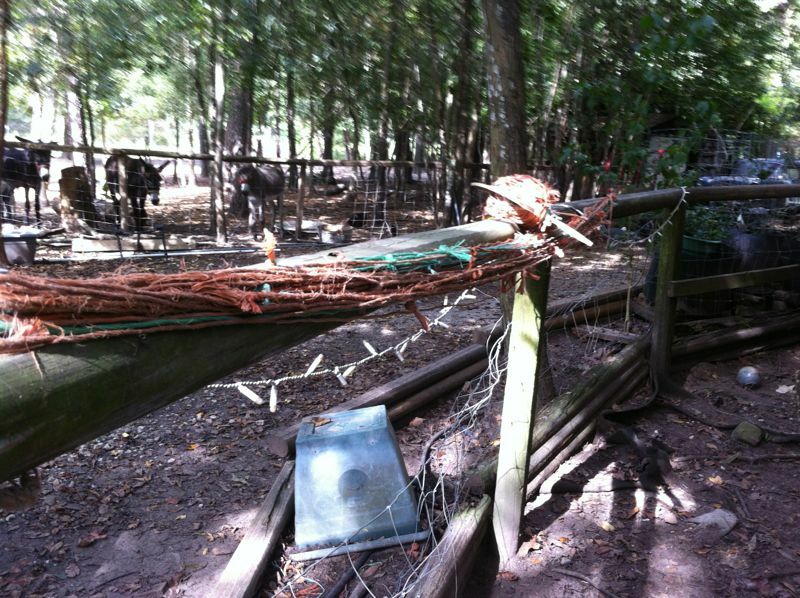 The combination of fences allows one to fence in many different types of animals. I do not know how long the T post will last but I already know it's more than 10 years in my soil. A bumper and a come-along are my preferred methods of making the barbed wires tight. I put spacers between the poles if I think they are too far apart. Attaching that range fence that you can see in the background to the two barbed wires and to each fence post is enough to hold it firmly for years. You can mount another barbed wire string at the top if desired. My animals seem smart enough to avoid injury on the barbed wire. It hasn't happened yet. Does it work. I think so. It stopped these guinea hens but they are not the sharpest blade in the drawer. It's not as pretty as painted wooden fence but it sure seems to work. This bare ground is what happens when donkeys pick a spot to roll in the dust. After my boundaries are set I think I will put another fence down the center of the property and rotate the donkeys, llama, and goats. Since they have different diets just separating them and swapping pastures every few months should be effective. Also, I can tie out the donkeys without the llama escaping. The pink pipe with two handles is a T pole driver. The pipes that look like fence posts are exactly that and the driver drives them also. The T pole driver is a lot easier than a post hole digger and much faster. Speed and ease of use are two things I appreciate more the older I get. I will be adding to this pile soon. 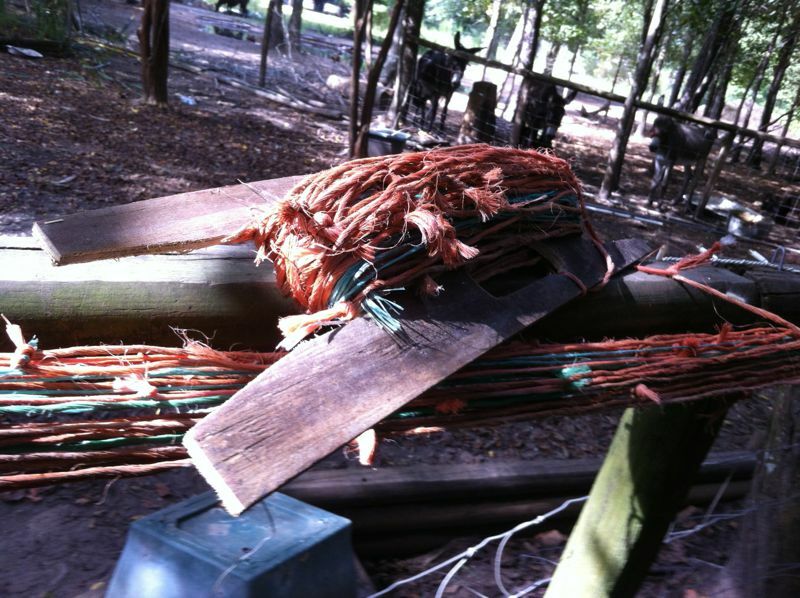 I have something that I intend to cut into new poles and there is still more barbed wire that I will cut and roll. When I put up a fence very little goes to waste. There is still a bunch of old fence to take down so it may be exhausting but it should be cheap. Cooler weather coming soon. I would say we are accidental farmers but that isn't actually true. Perhaps we are faux farmers. Some things, however, are just as serious as on a real farm.